Alcid Dreams | Great Auk - or Greatest Auk? I couldn’t sleep. It was almost time to get up, and I’d stared at the clock for what felt like most of the night. I was worried about making my boat on time; the MTA, curiously heedless of my personal needs and wants, had decided to suspend weekend service on the G line to do track repairs. And I was counting on the LIRR delivering me to Freeport in a timely manner, since the schedule got me to a point that was a half-hour’s walk from the boat 37 minutes before departure. Yes, in a fit of frugality/machismo/whatevertheheck it is with me, anyway, I’d decided to walk. Then, just when I’d started to drift off, two of the cats jumped on my recumbent form and got into a vicious fight perilously near to my vulnerable face. At that point, I figured that the universe was just messing with me, and got up. It was 4:45. 3.25 hours, one sheepish ride in a Long Island cab, one barely-caught LIRR train, two sloooooooooow subway lines, and a shuttle bus driver who ignored me later, I was on board the Captain Lou VII with coffee in my hand and hope in my heart. Straight away, I started adding birds to my year list (ah, January!) – birds like Double-crested and Great Cormorants, Long-tailed Duck, Common Eider, and Common Loon – the latter two prime examples of the fact that a bird can be Common (even in fact, as well as in name) and still a thrill to see, every time. More than fifty other birders, including Corey from 10000 birds (who also looked tired, for some strange reason…) and Andrew “The Birding Dude”, kept the boat lively as we passed under the Loop Parkway drawbridge and out into the gray expanse of the Atlantic. Alcids, above all, were what I wanted to see, and it wasn’t long before I got the first indication that I wouldn’t be disappointed. Almost as soon as the shore faded from view, we started spotting Razorbills. Razorbills flying, Razorbills sitting on the water, Razorbills alone, in groups of two or three, in flocks up to 25 birds strong. 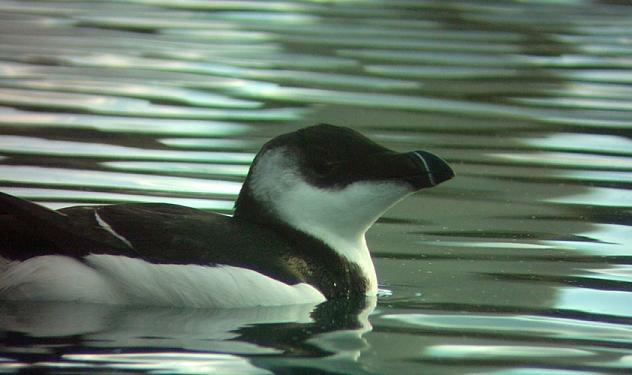 Morphology and DNA analysis alike point to the Razorbill as the Great Auk’s closest living relative. There are significant differences, of course – the Razorbills are about half as tall as Great Auks, and they can fly, the lucky little bastards – but the chunky bill, and (if I may) the remarkable good looks of the bird, speak clearly of an affinity. Also like the Great Auk – and like most alcids – it is dependent on small fish to eat, cool but not high-Arctic waters to catch them in, and small rocky islands to gather in colonies and breed on in relative peace, free from those predators who lack the wings to follow. Though the Razorbill is currently a species of Least Concern according to the IUCN, I couldn’t help but wonder as I watched them how long we’d leave them an ocean they could live in. Besides the Razorbills, a smaller but still generous number of Common Murres crossed our path. Some of them got quite close to the boat and provided excellent looks (although none were quite as obliging as the Common Murre I met off San Diego.) Common Murres, known to our European friends as Common Guillemots, molt at a rates that varies widely from individual to individual, so we were treated to the sight of both near-perfect winter and almost-breeding plumaged birds. Meanwhile, of course, there were whole other families of birds involved in this outing too. A cloud of gulls included, at various points, first-winter and adult Iceland Gulls, Black-legged Kittiwakes in abundance (perhaps because they can fly so fast that they move backwards in time and replicate themselves), and yet, oddly, no Lesser Black-backed Gulls – a situation that represented a total reversal of fortune from my last Atlantic pelagic. At least there were Gannets, although but few of them compared to, say, the Razorbills. Northern Gannets are among the best birds for just looking at of all time. And looking at them was a welcome distraction from certain salient facts, such as the fact that I was (despite actually bringing the right gear this time) getting very cold, and it was getting harder and harder to see anything through my binoculars, both of these conditions being due to the fact that the edge of the promised storm had overtaken us and rain was blowing in on us from all sides. The boat turned back, but the adventure wasn’t over; as we battled hypothermia with the help of Corey’s pretzel sticks, we crossed paths with more Razorbills, Murres, and Kittiwakes. Our return to Point Lookout revealed a few final goodies for the day, such as Purple Sandpiper, a male Harlequin Duck and a lone Sanderling. Finally, frozen but content, we staggered ashore. Thanks to See Life Paulagics! Thanks also to Shane Blodgett, the legendary Brooklyn superbirder who seemingly finds rarities every time he leaves the house, who was kind enough to give me a ride home (I refrained from asking him to pronounce a benediction on my binoculars). Safely ensconced with my cats, I made myself a cup of hot cocoa and dreamed… of yet more alcids. If there were still Great Auks, I’d probably spend all winter on a boat. Nice write-up of the pelagic. Razorbills are really cool birds. They have a much more striking profile than murres or guillemots. I’d love to get a close look at some. Thanks! And yeah, Razorbills have charisma. Even at a distance they’re fun to look at. I actually think that the majority of their charisma lies in their similarity to Great Auks, but that may be unfair to the Razors. Apart from that, I’d say it is their head profile. Congratulations on such a great pelagic trip and yeah, don’t young dads looks completely worn and wasted? And just for the record: if he was still able to do a pelagic trip, he really can’t have been all that tired at all, frankly.